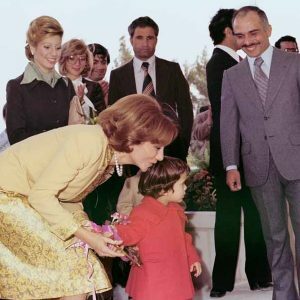 Forty years ago, on November 14 1976, their Late Majesties King Hussein and Queen Alia Al Hussein of Jordan inaugurated the Princess Haya Cultural Centre in Amman. Queen Alia promoted the creation of this non-government cultural centre to support the arts and develop awareness of Jordan’s heritage among children. 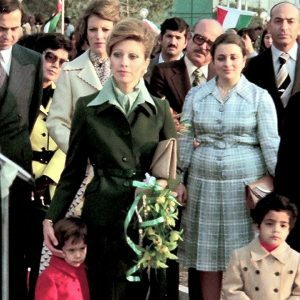 At the inauguration ceremony, the late Queen was accompanied by her daughters, Princess Haya and Abir Muhaisen, Empress Farah Pahlavi, and King Constantine and Queen Anne Marie of Greece. With funding from His Highness Sheikh Mohammed bin Rashid Al Maktoum (Princess Haya’ husband) the Center was re-launched and expanded in 2014. It has feature playgrounds, a library, a culinary center, arts and crafts rooms, dance, drama, and music studios, and a state-of-the-art planetarium and theatre space for children. Tagged King Hussein of Jordan, Princess Haya bint Hussein of Jordan, Queen Alia al-Hussein of Jordan.